Fishing vessels greater than 14 meters in length are prohibited form fishing for molluscs using any type of towed gear (e.g. mussel dredges, suction dredges) within the district (highlighted in grey in the chart left). 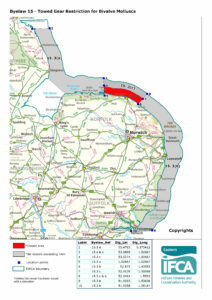 All vessels (regardless of length) are prohibited from using towed gear between Mundesley Church and Blakeney Church on the North Norfolk Coast out to 3 nautical miles (highlighted in red on the chart left). A detailed chart of this area can be seen below. Detailed co-ordinates can be found in the byelaw. Some vessels have been granted an exemption to this byelaw by virtue of historical activity. No person shall in fishing for bivalve molluscs in the Committee’s District use any kind of towed fishing gear. using a vessel that has been issued with a derogation by the Committee. 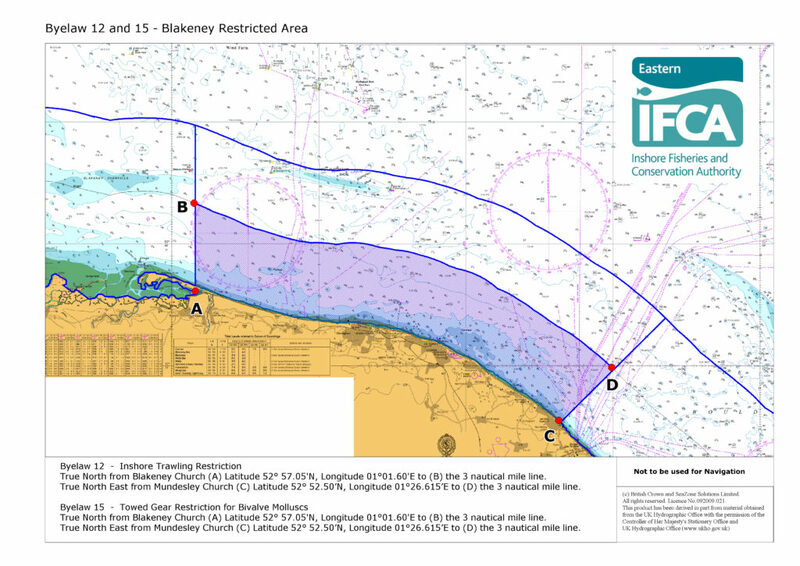 The Committee shall issue a derogation to a vessel for one or more of the areas defined under paragraphs 3a, 3b & 3c below, where evidence can be provided by the owners of having fished in these areas prior to 1 st January 2008. Applications for derogations can be made to the Joint Committee in writing and must be received no later than 6 months after the date of confirmation of this byelaw. Supporting evidence must be provided at the time of application. Any vessel issued a derogation under paragraph 2(c) above may continue to fish until such time as the vessel changes ownership or ceases to fish. between a line drawn True East from the control tower at the Royal Air Force Gunnery and Bombing Range at Donna Nook in the County of Lincolnshire (Latitude 530 28′.22N, Longitude 0000 09′.24E) being the northern extremity of the District to a line drawn True North from Blakeney Church in the County of Norfolk (Latitude 520 57′.05N Longitude 001 0 01′.60E) which lies outside the boundaries of the Wash Fishery Order 1992.
between a line drawn True North East from Mundesley Church in the County of Norfolk (Latitude 52 0 52′.50N Longitude 001 0 26′.15E) to the northern edge of the causeway (Latitude 51 0 55′.76N Longitude 001 0 16′.90E) situated opposite Lower Marine Parade at Dovercourt in the County of Essex to where it intersects the line of mean low water and thence drawn seaward on a bearing 1000 True, being the southern extremity of the District. between a line drawn True North from Blakeney Church in the County of Norfolk (Latitude 52 0 57′.05N Longitude 001 0 01′.60E) to a line drawn True North East from Mundesley Church in the County of Norfolk (Latitude 520 52′.50N Longitude 001 0 26′.15E) which lies beyond three nautical miles from the 1983 baselines. ownership of the vessel will be determined by the records of ownership maintained by the Registry of Shipping and Seaman and shown on the Certificate of Registry of a British Fishing Vessel. the overall length of the vessel shall be the overall length as determined by the Registry of Shipping and Seaman and shown on the Certificate of Registry of a British Fishing Vessel. 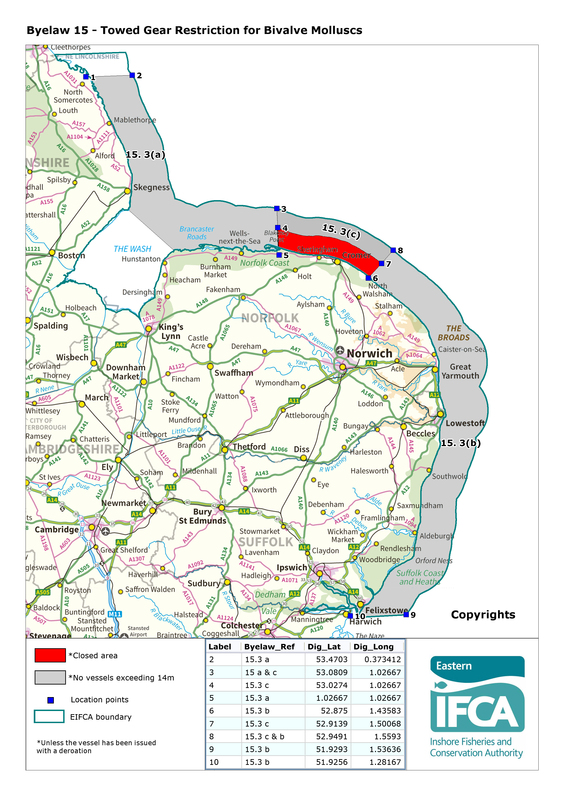 the boundaries of the Wash Fishery Order 1992 are those parts of the Wash in the Counties of Norfolk and Lincolnshire which lies below the line of mean high water and are shown coloured pink on the definitive map of the Order. This byelaw does not prejudicially affect the historic rights of several fishery described in Section 6(a) of the Sea Fisheries Regulation Act 1966.